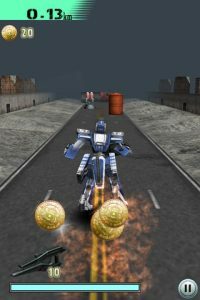 Iron Run is an iPhone game developed by D2C Inc. Free for a limited time only, Iron Run is post-apocalyptic game where you must pilot a humanoid robot. Your mission: escape from the city! In the not-to-distant future, a city corrupted by a rogue computer has been slated for obliteration from the face of the Earth. As the player, your job is to escape in a humanoid mech before its too late. On your way out of the city, you’ll need to evade obstacles, upgrade your mech, and find the finest weapons available. The best part of this game is the intuitive control system. Using controls that are virtually identical to Temple Run, you simply swipe your finger across the screen to dodge obstacles. 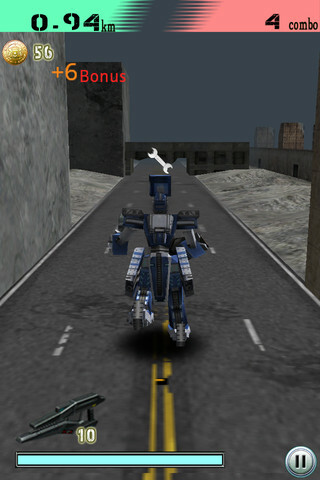 Firing weapons is done with just a single tap on the screen, and swiping up and down allows sliding or jumping. 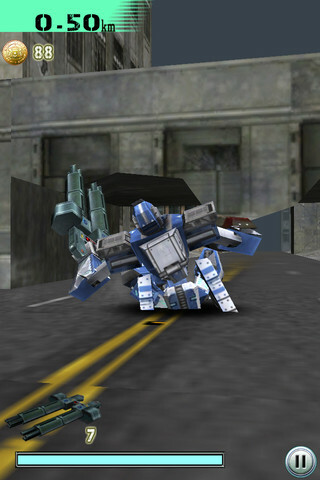 The graphics are great, and there are tons of different ways you can augment your mech. 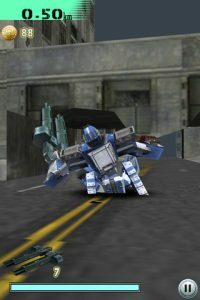 You can pick various mechs once you have enough coins saved up from your runs, plus you can add weapons and other items as well. It’s really fun to see all of the different roadblocks that come along, from overturned cars to more menacing items. One thing I do dislike about the game is the pricing for upgrades. It would take quite a long time to earn enough in-game currency to upgrade to even the most basic weapons. Iron Run is ranked in the top spot for Overall Free Downloads in 10 countries, including Germany, Italy, Netherlands, Denmark, Brazil, Norway, Sweden, and Canada. 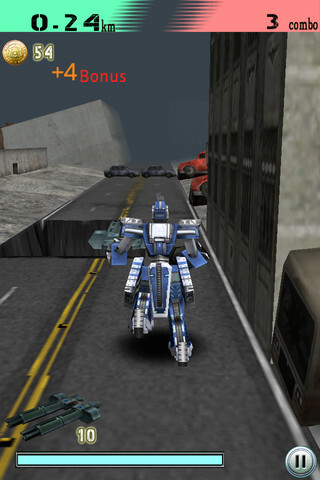 If you’re sick of Temple Run, Iron Run is a sci-fi take on the running game genre. It’s got a lot of flair, and a pretty decent soundtrack to boot. 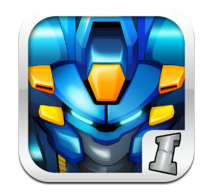 Iron Runis compatible with iPhone 3GS, iPhone 4, iPhone 4S, iPhone 5, iPod touch (3rd generation), iPod touch (4th generation), iPod touch (5th generation) and iPad. Requires iOS 5.0 or later.